While we look forward to 2018, we can’t help but look back and take stock of what a great 2017 we’ve had. It was an incredible year filled with awesome people, magical destinations and inspiring photography. These experiences simply would not have been possible without the folks who attended our workshops, lectures and events. 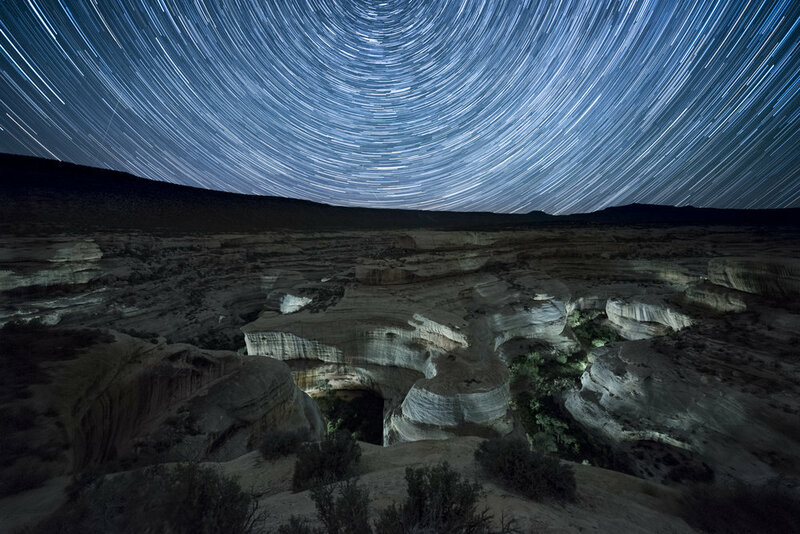 To all of the National Parks at Night alumni, supporters and followers, we say thank you. You’ve made our year a truly memorable one. As we all move from this year into the next, it’s natural to look back at work we’ve done and art we’ve created, to remember great experiences, or to see how we’ve grown creatively. 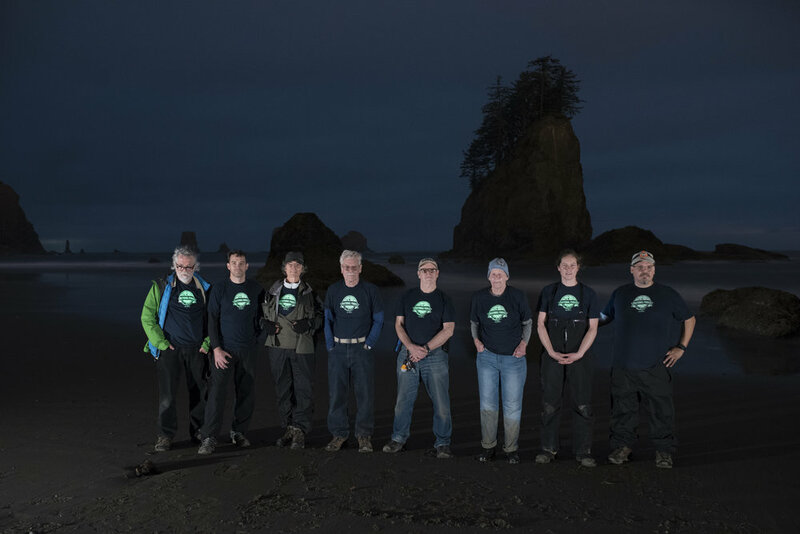 For our final blog post of the year, the National Parks at Night crew did just that. Below we share with you our favorites two images each from 2017, and our thoughts about how we created them. Cape Cod National Seashore, Massachusetts. Nikon D5, 14-24mm f/2.8 lens. 20 seconds, f/3.5 ISO 8000. My two favorite photos of 2017 were both from the coast—probably not a surprise if you know me, as I love being on the shore, and I love shooting on the shore. The first of my favorites is a photograph I made the night before our Cape Cod National Seashore workshop started in May. I was out with Lance, his fiancée Katherine, and a former workshop participant and friend, Wendi. We went out to a spot suggested by a couple of rangers that afternoon (always talk to rangers, they know the best spots!). The hike involved some wet shoes and a lost filter, but also brought us to an amazing boathouse that I spent most of our time there shooting. I was the first one to finish up, and I had gotten (if I’m to be honest) kind of bored with the location. But the others were still working, so I started tooling around with this composition instead, framing the shore in the foreground with the water in the middle and two distant boathouses in back, all topped with a beautiful starry sky. I added subtle light painting to the foreground by bouncing the light from a Coast HP7R off my palm and laying the reflected soft illumination along the rocks and grass. A little artificial ambient light did the rest, filling in the shadows of the background. Olympic National Park, Washington. Nikon D3s, 15mm Zeiss Distagon f/2.8 lens. 30 seconds, f/2.8, ISO 8000. In the shoulder season between late summer and early fall, Matt and I were leading two workshops in Olympic, one of my very favorite of the national parks. I got a text from Stacy, another of our former workshop participants, who happens to live in nearby Seattle, alerting us that a high Kp rating meant we should keep our eyes on the northern sky that night. We might see aurora! 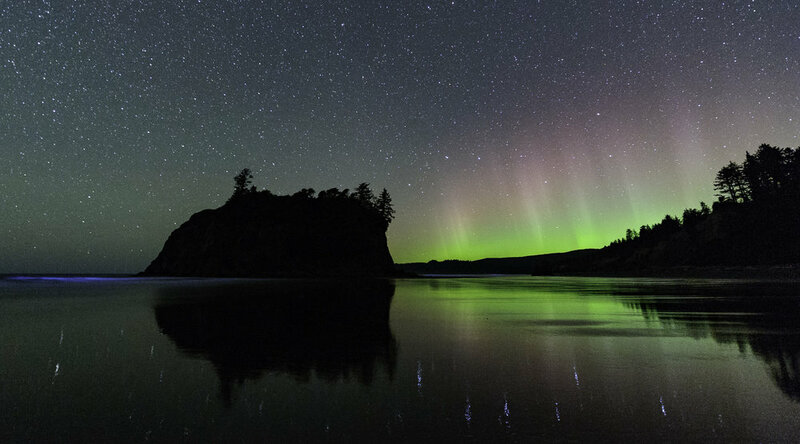 Sure enough, as we combed Ruby Beach looking for night compositions, the northern light show started. It was my very first time seeing and photographing an aurora. Moreover, the moon was just about to set on the Pacific horizon, the Milky Way was arching over us, and blue bioluminescence glowed in the crashing waves. It was hard to know which direction to point the camera. This is one of my favorite photos from 2017 not because I think it’s a spectacular artistic achievement, and not because it accomplishes any hefty technical goal—but because of the memory, because of the experience. With all of that going on in the same night sky, reflected in the shimmer of a recently submerged shore, above my favorite spot to shoot in one of my favorite national parks, how could I be anything but awed? And … did I mention it was my birthday? Hovenweep National Monument, Utah. Set of two exposures using the Nikon D750 and 14-24mm f/2.8 lens set at 14mm. Sky exposure: 20 seconds, f/2.8, ISO 3200. Foreground: 3 minutes, f/2.8 ISO, 1600. I love that night photography has many challenges. If it is too easy, I don’t want to click. The constant search for pushing my visions yielded some exciting results in 2017! For the last few years I have been wanting to master the night panorama. It is one of the only solutions for the hero shot of the arching Milky Way. Hovenweep National Monument offered the perfect foreground and location for such a challenge. The night sky was dark and full of stars but the 90 F temperatures would definitely test what I could get out of my gear, because extreme heat can generate noise in images during longer exposures. My initial tests were showing red flecks at exposures longer than 45 seconds. I assessed that my pano would need to be made up of six shots, however the sky and foreground were at least three stops apart. My sky exposure was 20 seconds, f/2.8, ISO 3200 and my foreground was 3 minutes, f/2.8, ISO 1600. I did the series of sky shots first, as the Milky Way was quickly moving out of my composition. The foreground was taking over 6 minutes per shot, because I needed to turn on Long Exposure Noise Reduction. After I worked on general adjustments to the images, I was pleasantly surprised that Lightroom and Photoshop were able to align the whole batch fairly easily. I attempted a few more panoramas more recently that needed a dedicated panorama program, as Adobe was having a hard time aligning the dark subject matter. However, I absolutely love the final image as well as the slow, methodical thought and post-processing that needed to happen to make this work. Total solar eclipse, Sawtooth Mountains, Idaho. Fuji X-T2, 100-400mm f/4.5-5.6 lens 1/15 second, f/22, ISO 400. The biggest celestial event of the year was definitely the Great American Eclipse. I was thrilled to be leading a workshop around it in a place that was surrounded by an incredible landscape, Montana’s Centennial Valley. The challenge for most of us attempting to photograph this was that it would be something we would be experiencing for the first time. The window for success was small, because the total eclipse is so fleeting—we wanted to choose the best spot for clear skies and totality. It was easy to find the path of totality, but difficult to predict the weather. Add to that new gear—solar filters which made it difficult to operate our cameras and lenses in normal ways—and it required plenty of practice. 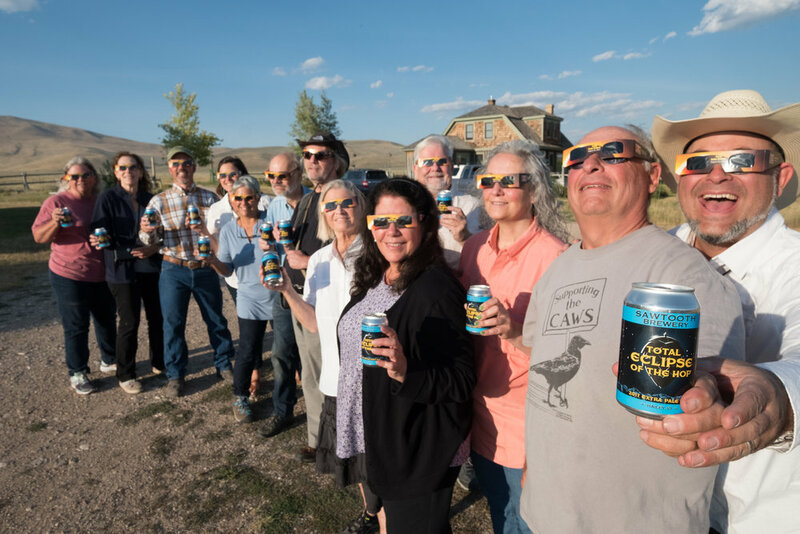 We opted to experience the eclipse in a remote location sandwiched between the Sawtooth Mountains and Beaverhead Mountains. We arrived early and assessed the path of the sun with the PhotoPills app, which was invaluable to scouting and pre-visualizing. Most of us were running two rigs on tripod—a wide shot and a telephoto. The telephoto needed the most attention as it required constantly tracking the sun across the sky. When the eclipse began, the clicking and adjusting of exposures started to build to a bit of a frenzy. 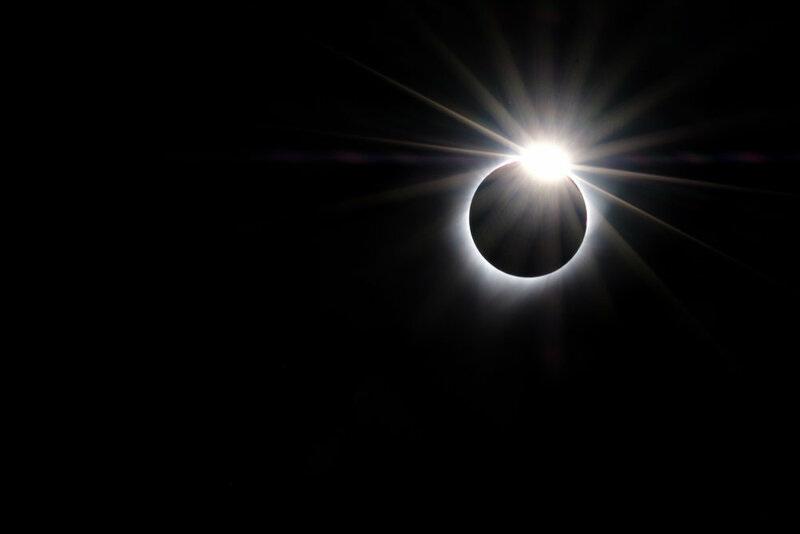 Capturing the corona, diamond ring effect and Bailey’s beads were all high on our list. But the real challenge was controlling our excitement during the moment. It was hard to make the quick adjustments while simultaneously experiencing such a thrilling moment! As we entered full totality, a strange silvery twilight light encompassed us all and a quiet hush fell across the land. The best thing I did during the 2-plus minutes of darkness was take 15 seconds to just stare at the eclipse and take it all in. I’m still searching for the words to explain the experience. The one thing I do know is that I want to be part of it again, so … see you in 2024! Westfjords, Iceland. Nikon D750, Sigma 24mm f/1.4 Art lens, 5 1/2 minutes, f/5, ISO 800. I’ve spent a fair amount of time looking at this scene––it’s right in front of the Hotel Djupavik in the Westfjords of Iceland. It’s a special place, one that has a calming energy that’s hard to describe. It’s hard to be stressed or unhappy or angry there. It’s hard not to be taken in by the charm of the place, the people, the peace. So you see, to me this photograph is about much more than a landscape—it’s about a state of mind. The making of the image was rather unremarkable. The one streetlight in the village illuminates the remains of the pier, 50 yards offshore. It was late in astronomical twilight, with just a hint of glow across the fjord in the western sky. The clouds were dragging slowly across the frame, reluctant to let go of the mountaintops. It was almost as if they were afraid of being carried out to sea. I remember being torn between using a short, high ISO exposure to keep the stars sharp, and a longer one to capture the movement in the clouds. After making the first trial exposure, I noticed that the streetlight was reflecting off a few of the patches of seaweed, so I had the idea to sweep a light across the foreground to illuminate the rest of the seaweed to try to connect the foreground and middle ground. I had to put a couple of layers of CTO warming gel over my flashlight to match the orange of the sodium glow, but it seemed to work. To me, a photograph that can transport me back to a time and place is doing its job. I’ve been using this one as my screen saver since I made it during our Westfjords photo tour back in early September, and I’ve been dreaming of making a big print to hang in my home. I think I’ll make that print. Alabama Hills, California. Nikon D850, Irix 11mm f/4 Blackstone lens. 15 seconds, f/5.6, ISO 3200. One of the things that I love about this image is that it’s virtually unrecognizable for what it is. 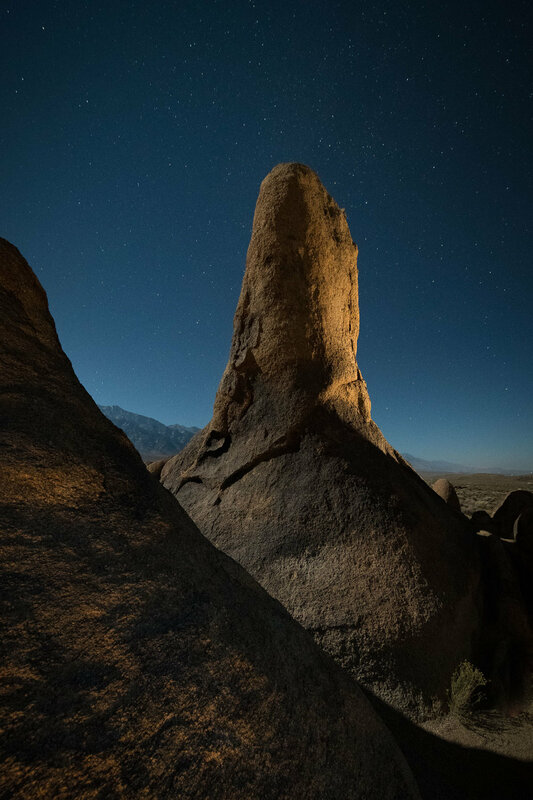 Lady Boot Arch is one of the better-known and certainly among the most distinctive rock formations in California’s Alabama Hills. It doesn’t take a lot of imagination to see the shape of a woman’s high-heeled, over-the-calf boot––when viewing from the spot where most people first lay their eyes on it. That also happens to be the perspective where most people choose to photograph it from, as I have done on multiple occasions. Being fortunate in that I get to revisit places like this on a fairly regular basis, I often find myself looking for unique vantage points to photograph a familiar subject. Toward the end of this particular night, after most of the participants had left for bed, I had the chance to pull out one of the new D850 cameras that Nikon had sent to our workshop. I was excited to see what this camera could do. I wanted to try it with the crazy-wide Irix 11mm lens. Conditions were great. It was cool, but not cold, the air was clear, and the three-quarter moon was over my left shoulder, high in the southwestern sky. I chose a 15-second exposure to keep the stars nice and sharp, as that 45-megapixel sensor likes to show every bit of detail. The challenge was lighting both the foreground and the back of the arch in that short time frame while squeezing between and scrambling over rocks. That was fun. Great Sand Dunes National Park, Colorado. Nikon D750, 15mm Zeiss Distagon f/2.8 lens. 234 images at 22 seconds, f/2.8, ISO 6400, plus a single exposure at 382 seconds, ISO 2000 for the landscape after moonrise. My fourth visit to Great Sand Dunes National Park and my second during a Perseids Meteor Shower finally yielded the photograph I’d been dreaming of making. This image is a perfect example of the value of persistence. Climbing the dunes at over 8,000 feet elevation is no easy task, nor is waiting patiently for hours to capture 15 meteors and the gentle kiss of moonlight rising on the dunes. 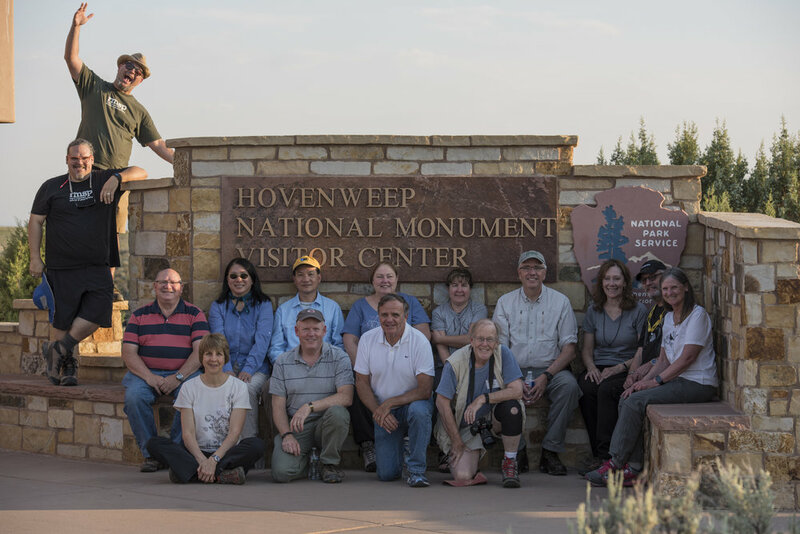 I’m really proud of the group we had on the workshop—everyone made the trek up the dunes. And everyone set up to capture the glory of this active meteor shower. I’m especially delighted that careful planning put us in the right place at the right time to make a singularly gentle and powerful photograph combining the tallest sand dunes in the U.S., the Milky Way and meteors arcing across the night sky. Olympic National Park, Washington. Nikon D750, 35mm f/1.4 Sigma Art lens. 61 seconds, f/2.8, ISO 6400. I’ve always been drawn to water. It calls to me. Its power to overwhelm anything while holding no strict form has always mystified me. It refracts and reflects light. And it changes everything it touches, such as the sea stacks at Olympic National Park. Low tide at Rialto Beach gave us an opportunity to use the wet sand as a massive mirror. The setting moon wrapped the left side, and a decisive placement of light painting warmed up the right and brought out the texture of the stalwart stone and tenacious trees. A harmony of color, time and movement keeps this at the top of my list of favorites. Alabama Hills, California. Fuji X-T2, 16mm f/1.4 lens. 23 exposures at 4 minutes, f/5.6, ISO 100. Serendipity is one part luck, one part preparation and one part faith. 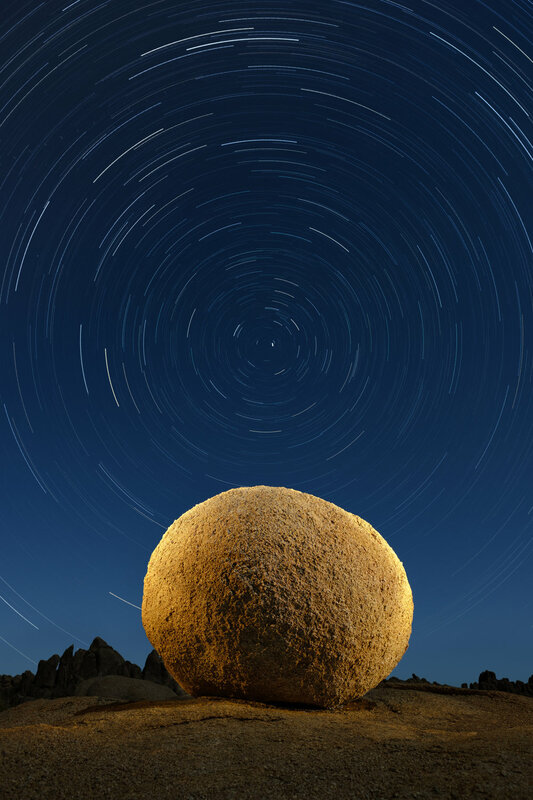 This image—“Boulder, North Star Ring, Alabama Hills”—is a perfect case in point. I’ve been enamored with the boulders of the Alabama Hills in the Eastern Sierra of California since the first time I saw them. The texture and unusual formations of these boulders is simply otherworldly. I had the opportunity to return to this area for our November Eastern Sierra workshop with Lance. On the first day of scouting, something sparked in my mind and I began to imagine a round boulder lit from either side, composed underneath the concentric star rings of the north sky. This type of pre-visualization doesn’t happen with every image and it rarely turns out exactly the way I want. Over the course of the week, I kept searching for the perfect round boulder—one that had a good background to the north, and was positioned such that I could paint it from either side. Finally, on day 4 of the workshop, I stumbled onto the perfect specimen. The trick here was to stack enough exposures to give the impression of star rings. The moon was nearly full so I was limited to a 4-minute exposure at f/5.6, ISO 100. I set my ShutterBoss intervalometer to shoot 40 frames, knowing my battery would probably run out before draining completely. By the time that happened, the camera was able to capture 23 images, resulting in roughly 1 1/2 hours of cumulative exposure. After replacing the battery, I took several more exposures while experimenting with the light painting. The final image is a Photoshop composite of the 23 frames of star trails and one image with light painting. For me, this was one of those rare instances where a preconceived idea closely matched the final product. Sedona, Arizona. Nikon D4s, 14-24mm f/2.8 lens set at 14mm. Eight exposures at 4 minutes, f/4, ISO 200. Setting up an image for capturing star trails is always an exercise in anticipation. Which direction will the stars trail? How long will they be? Will they be sparse or thick? For this image taken outside Sedona, Arizona, I had a good idea of the outcome before plunging the shutter. The reason? I had shot from this location before. This is not unusual for me. I’ll often try to improve upon locations I’ve shot in the past. My first attempt at this scene was made with a medium wide-angle lens (24mm on a full-frame camera). That image portrayed the stars moving diagonally, but in only one direction. For this last visit, I was carrying my venerable Nikon 14mm-24mm f/2.8. The wider (14mm) focal length included much more of the sky. My earlier image contained only the mountain to the right, but with this wider 14mm I was able to include both peaks. Facing southwest allowed me to capture longer trails as stars raced across the sky in the south, as opposed to the shorter trails in the north. The wide view to the east also produced another cool feature: the divergence of star trails. Longer lenses capture the trails all moving in one direction. By facing east and using a super-wide lens I was able to capture the area where the stars begin to move in opposite directions. We’ve shown you our favorite photos from 2017. Now we’d love to see yours! Post your No. 1 favorite night photography image from the past year in the Comments section or on our Facebook page, and tell us a little bit about it. And then of course the next step—for all of us—is to get back out into the night in 2018 and make something even better!